A Swedish bride of the 19th century wore a black 2-piece dress with a white collar. She also wore a headdress or Bridal Crown, with or without a veil. The groom’s attire consisted of a black suit, white shirt, bow tie and possibly white gloves. The bride usually made her own wedding clothes, which would be considered her most beautiful garments. Sometimes certain garments were passed from one generation to the next. Her ensemble was adorned with decorations such as tissue paper flowers because real flowers were not considered good enough. Ironically, the next time the bridal couple’s wedding clothes would be worn would be as their burial clothes. Often a wedding feast lasted for 3 days. 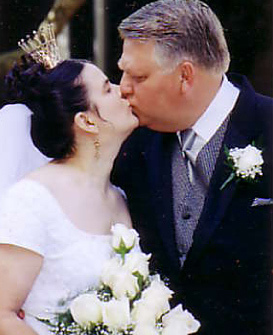 The bride wore her hair down for the very last time on her wedding day. Ceremoniously the headdress of a married woman was put on her head during the wedding ceremony. The headdress might be a hat, bonnet or kerchief. A married woman had a higher social status than an unmarried woman and she would be expected to be treated with respect; therefore, women wished to show their social position by wearing the married woman’s headdress. After coming to America, many Swedish immigrants abandoned the wedding attire of their homeland in favor of the fashions that were popular here at the time. However, the first generation of Swedish-Americans often returned to the old traditions such as wearing the Bridal Crown. Bridal couples in Sweden today wear what we would consider traditional wedding attire: a white dress and tuxedos, just as their wedding celebrations are similar to weddings in other European countries or the USA. A church wedding is still the most popular type of wedding. On the Sunday before the wedding, the couple may have a lysning. This dates back to the old tradition of listening to the public announcements in church of a proposed marriage. It is usually a daytime party with a meal and a few drinks. It is traditional to take the couple’s wedding gift to the lysning and not to the church. On the day of the wedding, the bride’s family welcomes the guests to the church. The couple walks down the aisle together to the altar, and they receive their guests outside of the church following the ceremony. At the reception the couple sits under an arch of flowers. The meal is interrupted often by speeches and songs from family and friends. Celebrations such as weddings call for an elegant smörgåsbord. At a festive smörgåsbord the standard order is to start with fish, followed by meat and the hot dishes and then finish with cheese. Generally, the rules to remember are fish before meat and cold before hot. In the region of Skåne, dinner might be followed by the towering confection called a spettekaka or spit cake. 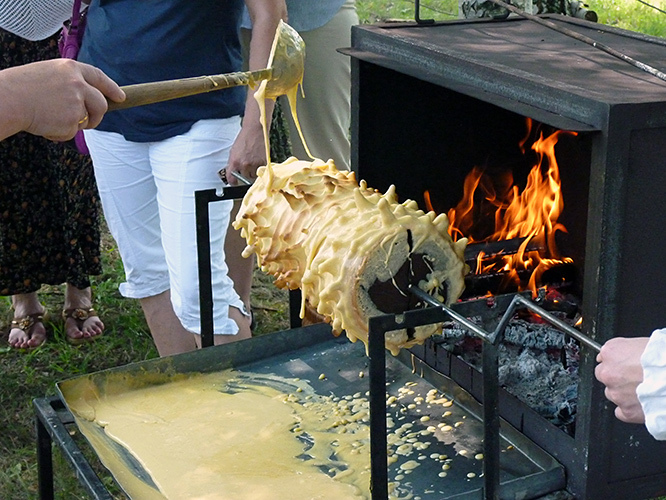 This meringue-like tradition is created by drizzling the batter - consisting of dozens of beaten eggs, sugar and a bit of potato flour - slowly over a cone-shaped spit rotating over a slow fire. This forms many lacy layers. Spettekakor can reach 2-3 feet and are decorated to suit the occasion. Most are created by professionals.